Every super-hero worth their salt needs a nemesis. The yin to their yang, the Moriarty to their Holmes, the Buster Keaton to their Harold Lloyd and the fly that won’t stop crawling into their ointment. For the Champions, that position has been taken and filled by the Freelancers, a super-powered team of morally questionable thugs who delight in taking payment from the highest bidders to do the sort of ethically bankrupt jobs that no-one else will. Like clearing low income neighbourhoods of their “undesirable” tenants so that they undergo the process of gentrification and return a higher profit margin for the faceless corporations and banks who sold the original occupants the worthless mortgages that are used as the legal smokescreen for the highly illegal evictions. The Freelancers are the kind of second-rate bullies who would always take the smallest kids lunch money and who in later life, having failed at everything else, become unlicensed rent-a-cops and over-zealous Health and Safety officers. Or they would have done, if they didn’t possess godlike powers which grant them carte-blanche to indulge at leisure in all of their more socially unsavoury behaviour and make a killing while doing it. 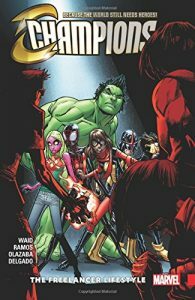 And the only folks willing to stand in their way, or try to stop them, are the Champions, leading to a whole heap of trouble for the idealistic young heroes who, thanks to their foes, discover that doing the right things doesn’t always turn out the way it should. The problem with getting in the way of folks who have no sense of right or wrong and are filled with the sort of self-entitlement that allows them to think that they can do what they want, when they want, is that it never ends well. For anyone. 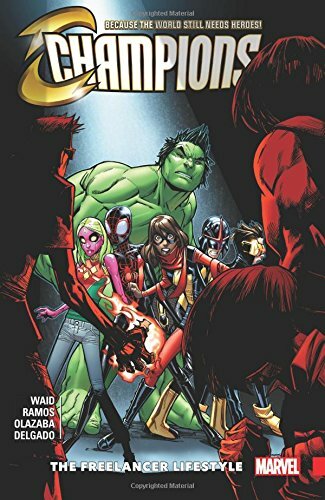 And when the Champions stop the Freelancers doing what they like to do best, they’re given a lesson in capitalism and the legality of business by the pay-for-play super-mercenaries that nearly brings everything that they’ve tried to build, and stand for, crashing down around them. It’s a bitter pill for the Champions to swallow, but one they learn from and rise against to school their would be teachers in idealism and how a cause and a set of beliefs can often be more rewarding, and powerful, than cold hard cash. Just after their tussle with their collective Moriarty, they find themselves in Las Vegas following the Hydra strike in a near fruitless search for survivors that makes them reconsider their position regarding the old guard and preparing for the fight that will bring the Secret Empire to its knees. Finally, and wanting to go out on low note, The Freelancer Lifestyle shifts gears for its concluding chapter as the team discover what makes Cyclops tick, why he’s so tightly wound and why sometimes, it’s better to let people be who they are, as young Scott Summers rides, and takes his friends on, an emotional rollercoaster that the team, despite not wanting to remember it, will never forget.